Your Chakras are the center of spiritual power and energy in your body. unbalanced, it can manifest into physical, emotional or spiritual ills. mind, your body and your soul. A Chakra Cleaning/Balancing is like a 'massage' for these meridians! face up, fully clothed, while beautiful meditative music plays. The room is softly lit and incense is burned. Smudging (sage burning) is how we begin. 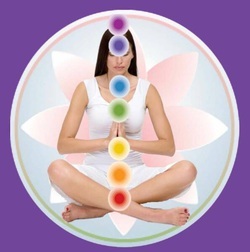 which will start to open each Chakra as my energy assists you in relaxing and bringing yourself back into balance. crystals (touch) are used in addition to my pendulum to "see" which of your Chakras have opened fully. long after the session is complete! Give the gift of this special time to your whole self! Make SURE to include your cell phone number, available days and times for your healing session! 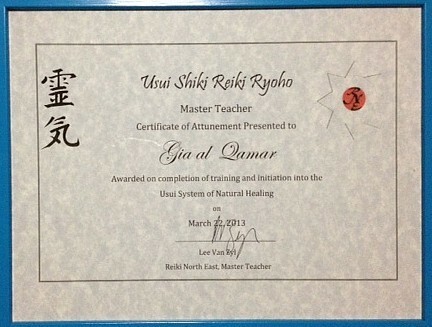 Make your Appointment for Reiki Energy Healing! 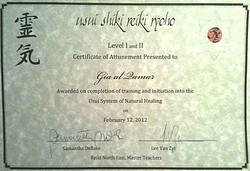 Gia is a Certified Reiki Master! YES! Reiki encourages your body’s natural ability to heal! on the crown chakra (top of the head), arms, legs and abdomen. and cleaning the chakras to aid in your wellness! often a feeling of greater energy and overall wellness usually after 1-3 sessions. 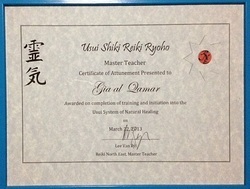 Reiki is done fully clothed in the same manner as I described in Chakra Cleanings. Diagnosis through 'scanning' is done first, then the session, (usually 45-60 minutes).The use of crystals, calming music, pendulum is often used. PLEASE Notice! NO REFUNDS will be given with less than 24 hours notice! No exceptions. healthy ones we encourage...the negative need to be removed! energy can affect us so dramatically that we need to take action. have low energy, are sleepless, have nightmares or are simply feeling bad in another person’s presence...this will benefit you. Cutting will assist in removing the attachment this Energy has over you! ones can be re-established if you choose to do so. Also...victims of emotional or physical abuse will find this freeing and healing. well-being AND enables you to re-establish more positive bonds if and when you choose. Cord you wish to have addressed. 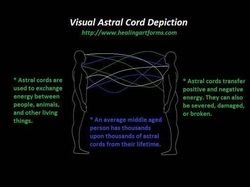 You can choose to have between 1-2 cords removed in a session that is combined with a Reiki or Chakra Balancing. If there are 1-3 cords that you wish to have addressed, you should schedule a 30 minute session. Those with multiple (4+) attachments should schedule an hour-long appointment.